What do you say ABOUT somebody whose courage takes your breath away? The STORY section describes in detail why we’re doing this project, but to pick a word that describes Barb the person, she was all about ACTION. She never wanted anyone to feel sorry for her. In fact, Barb never talked about her disease because she didn’t want people to treat her differently. “What is, is,” she would say. “People get a lot of things. Me, I got lung cancer.” That’s not to say she didn’t fight her disease vigorously. She did everything Dr. Howard West, her oncologist, told her to do to keep strong. But that’s how Barb played the game. She had a very simple philosophy: you go as hard as you can and as far as you can for as long as you can. That’s your job. But she had a second job as well – and that was to create awareness for this terrible disease, which is on the rise, especially among women. She wanted passionately to support Dr. West whom she believed could find a cure so no one else would get this. 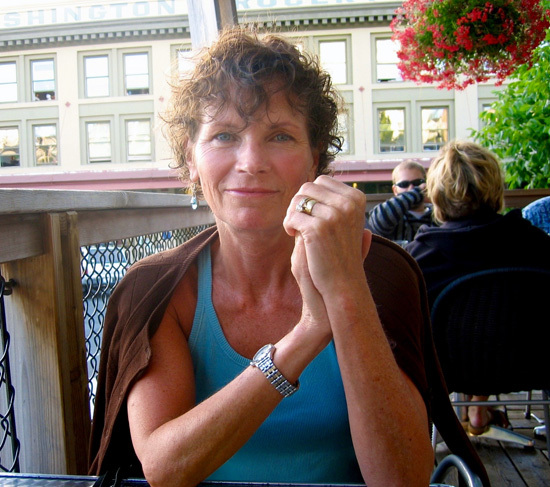 Again, the section on STORY tells how we (Barb’s family and friends) created Barb’s Beer and the Racing to Cure Lung Cancer campaign as an extension of Barb’s passion for action and her commitment to support Dr. West. But since this is the ABOUT section, here’s one story that epitomizes Barb: it was in the beginning, when we were first getting to know each other. We went to a road race in a rural area of Washington state. Running was the special thing we did together, a source of true joy. We were married for 33 years and I can’t remember a morning when we didn’t lace up track shoes and hit the roads for a run in the pre-dawn darkness. At this race long ago there were separate finishes for the men and women, and after I finished I doubled back to where the women’s finish was located to look for her, but I didn’t see her. Thinking maybe something bad had happened, I quickened my step, but still I couldn’t find her. Then after a long time I turned around and I saw her coming the other way, from the direction of the women’s finish. That was Barb – wind her up, and she’d keep going till there was no more going to go. “The road ended,” she said, just like that, as a matter of fact. We laughed and then we were off to find a tavern for a pint and conversation – another joy we shared along our 33-years on the road together: good beer and great conversation. Barb was the most powerful teacher I’ve ever known and I try to keep clear in my mind the life lesson she taught by her powerful example: you go as hard as you can and as far as you can for as long as you can. Stay mindful of what you can for others, but make damn sure to have fun and search out a good pint along the way. Learn how you can SUPPORT THE CAMPAIGN AFTER TOM’S RUN ! 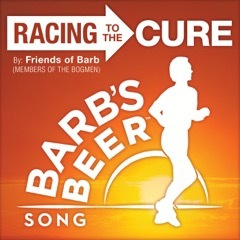 Members of a highly popular NY band, ‘The Bogmen’, created a song for Barb’s Beer called ‘Racing to the Cure’ (the Barb’s Beer Song). P.J. O’Connor and Brendan and Billy Ryan, took lyrics by Tom Murphy, Barb’s husband, added a warm, inspiring tune and perform the song as, “Friends of Barb.” Preview our Barb’s Beer song below, then download it to support the Barb’s Beer cause! Visit SLIDE SHOW to hear the song played out against photos of the campaign in action!